“Bart was strangely quiet. Later he would explain he was confused by feelings of respect for me.” – Homer. Written by: Ken Levine, David Isaacs. 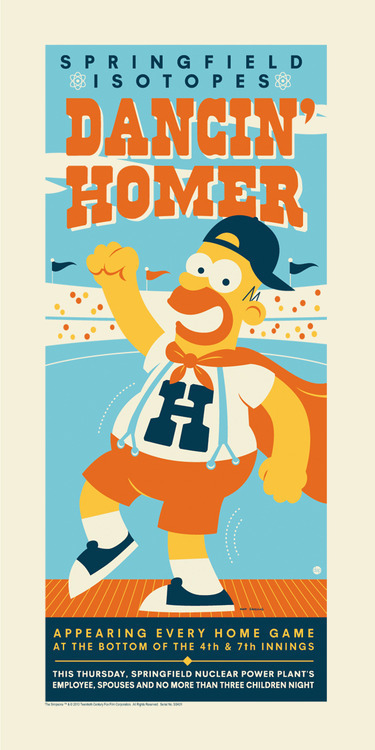 “Dancin’ Homer” takes its place in The Simpsons pantheon because it’s the first of the “Homer gets another job” episodes, which would eventually become a staple – if not the primary guiding engine – of the entire series. Given that the list of jobs that Homer Simpson has had over the years is massive, it’s kind of ironic that the writers felt have him request a leave of absence prior to becoming Dancin’ Homer in Capital City. Another sign that they weren’t sure the audience would go for it: Homer tells the whole tale in flashback, sitting with the other regulars at Moe’s. In the future, of course, they didn’t really worry about any kind of verisimilitude when it came to Homer’s escapades. 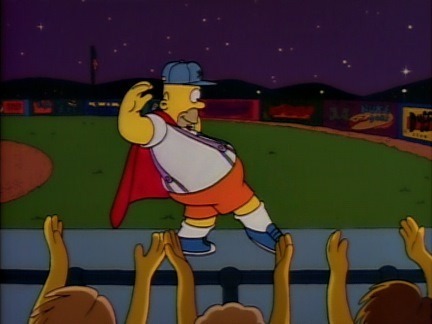 In the meantime, the story of Homer inadvertently becoming the good luck charm and mascot of the Springfield Isotopes by dancing on the dugout after sharing a few tubs of beer with Mr. Burns (who, continuity nerds might remember, had vowed to destroy Homer’s life the previous week) is fun throughout. That said, despite loads of funny jokes and references, the ending – where the cynical Capital City crowd didn’t really go for Homer’s antics – felt a bit flat, like it was there because of course The Simpsons belong in Springfield, no matter how much Tony Bennett might extol the charms of Capital City. Which is just a quibble: “Dancin’ Homer” definitely deserves its status as a much-beloved and iconic early episode.